A good, persuasive landing page grabs the attention of visitors and compels them to complete a conversion. Learn how you can create a winning landing page with these nine simple landing page tips. The look, feel, and overall structure of your page design will have a huge impact on the effectiveness of your landing page and how well it drives conversions. The primary goal of your landing page should be to make it as easy as possible for a visitor to convert, so it is important that all elements of your page work towards the conversion objective, whether it being filling out a form, making a purchase, signing up for a newsletter, or downloading an ebook. An effective landing page design makes smart use of color and eye-catching images. Certain button colors such as red or green are said to increase landing page conversions, but above all make sure that there is a strong contrast between your button color and your background. There are many different button attributes you should test to ensure a good landing page – test color, placement, and size to discover the most effective landing page layout. Be sure to maintain a clean page with obvious, natural navigation and no distractions (such as pop ups). A good landing page provides all the necessary information needed to encourage visitors to convert, but nothing extra. Too much info can overwhelm visitors, so keep it simple and provide only the essential information that will guide visitors down the funnel. The info you do put front and center should be easily scannable – good landing page copy uses bullet points to explain details when possible. Take into account what key info needs to be shown above the fold within the visitors’ direct line of vision, and what can be put below the fold. Most visitors naturally know that they can scroll down for more information, so don’t be afraid to add more thorough descriptions down where they will be discreetly hidden. A good landing page design maintains a clean and attractive visual impression while still allowing visitors the information they might desire in a non-intrusive way, and taking advantage of the below the fold space is one great way to do this. Another way to add more information without overwhelming visitors with text is through video landing pages. Consider highlighting the key points of your offer with text and using an optional, clickable video to explain the details. Get more quality Twitter followers – fast! Some landing pages choose to push their value proposition to the main headline and use the sub-heading to discuss the actual software or offer. Don’t forget, you have about 8 seconds to convince users your offer is worth pursuing, so it’s absolutely essential that your offer and value proposition are clear and convincing. Good landing pages make abundant use of trust signals, which can indicate to visitors that their offer and brand are trustworthy. Trust signals can take a number of different forms – testimonials are a classic form of trust signal, capitalizing on word-of-mouth to reassure visitors with endorsements from past clients or customers. This can also be done with “Like” counters, which push a more subtle form of endorsement through “Likes” and +1s from various social media sites. Another powerful tool implemented by effective landing pages are trust badges. Trust badges often refer to the logos of well-known brands you’ve worked with in the past, certain endorsements and recognitions you’ve received, groups and coalitions you are a member of, etc. They serve as endorsements of your trustworthiness and skill. Even unofficial (and, honestly, meaningless) buttons like those purchased from stock graphic sites add an element of trust and build confidence in your offer. These days it’s essential that your landing page can easily be navigated on mobile devices, as nearly 30% of all web activity comes from mobile. It’s been shown that having a mobile-friendly site can even double your conversions. Your landing page should look and feel great on mobile devices – easy to navigate, fast loading, and ultra clickable. If you want to learn more about making your landing page mobile ready, check out our guide to creating mobile-friendly websites. When a user visits your site, naturally as an online marketer you want to collect as much data as you can from them. However, when it comes to creating a good landing page, less is more. It is extremely important that you make users fill out as few form fields as possible. The more fields you ask a visitor to enter, the less chance you have of them filling out the form and completing the desired conversion. If your conversion requires a form, only ask the essentials of what you need. Remember, you can always ask for more info on the thank you page. With such limited data to be acquired, what form entries should you make required? Most users won’t mind providing their name and email address, but asking for phone numbers or date of birth can cause your drop off rate to skyrocket to 50%. Beware those form fields! If you have a great offer and have been promoting it well, you’ll likely be getting traffic from a number of different sources. If at all possible, you’ll want to customize your landing pages for different audiences. A user that arrives at your landing page from a Facebook or Twitter post is quite different than a user that arrives at your landing page from a PPC ad or a link from your monthly newsletter. Effective landing pages make sure to match the words used in their page copy with the keywords and text used in their PPC ads. Repeating the same language and key phrases reassures visitors that they’re on the right path and shows consistency. It’s also important to deliver users directly to the content they are looking for. If a user clicks a PPC ad about sleeping bags, don’t drop them in the camping section – you want to bring them to their exact desired destination. Match the user’s need as closely as possible – that’s where the conversions happen! The final hallmark of good landing page is testing. An effective landing page simply cannot be created without a thorough amount of testing. Testing and tracking results are essential for seeing what your landing page is doing right, and what it is doing wrong. Test, test, and test some more! Check out 15 more landing page ideas. Bonus: Test Your Landing Page Effectiveness for Free! 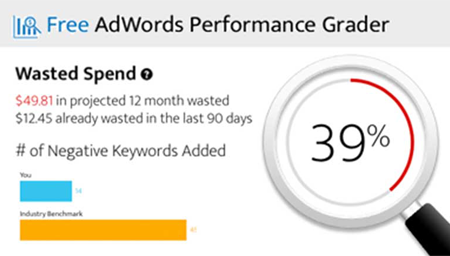 The AdWords Landing Page Grader is a free tool that checks your PPC landing pages for best practices, conversion rate optimization and more. Make sure your landing page is worth the click: It's fast, easy, and free!